If you suffer from allergies, you know how irritating and miserable reactions can be. Allergic reactions can cause itchy skin, hives, and general discomfort throughout your entire body, making your day difficult to get through. While we humans have the tools and knowledge to manage allergies, dogs aren't so lucky. What many novice dog owners don't realize is that allergies are a very real issue that canines can experience. Some owners don't even realize that their pup is suffering. Many just chalk it up to normal dog behaviors. However, a lot of the unwanted symptoms humans experience can be driving your dog crazy. So what do you do? The best way to manage allergies in dogs is to set them up on a hypoallergenic diet. There's a wide variety of food ingredients that are known to cause reactions in dogs. To provide some much-needed relief, you'll need to find the offending ingredient and supply your pooch with a kibble that's made to combat allergies. Here's a selection of some of the best options on the market for dogs with allergies. 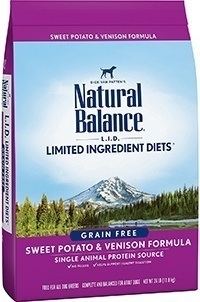 This formula from Natural Balance may help your dog get the nutrition they need without the risk of allergic reactions. It has limited ingredients. There's no unnecessary filler, artificial colors, flavors, or chemical preservatives. It's also free of many common allergens such as wheat, corn, and soy. Venison is used as the main protein source to help dogs that are allergic to other popular meats like chicken. For carbohydrates, sweet potatoes are used. They're a complex carbohydrate that can help your dog stay energized throughout the day. Also included in the recipe are flaxseed and salmon oil. These ingredients can keep your pup's skin and coat supple. 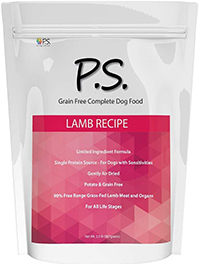 Specifically formulated to solve allergy issues, this dog food from PS For Dogs is a great option for any pooch. It has simple ingredients and doesn't contain common allergens. Lamb meat is used as the main source of protein. It also contains complex carbohydrates. This helps to contribute to the product's low glycemic index. Not only does it help avoid energy crashes, but the slow absorption can also prevent yeast buildup on the paws. The food is not like traditional kibble. It's made to look and feel like jerky. This makes it appealing for pups of any age and produces a soft texture that's easy to consume. 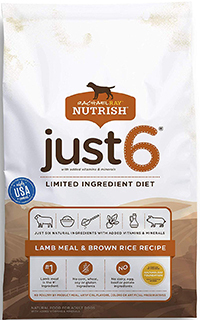 Rachel Ray's Nutrish is a healthy alternative to traditional kibble options. It's a limited-ingredient product that has only the essentials. Lamb meal is the primary protein source. It's easy to digest, provides plenty of muscle-building amino acids, and is a great source for glucosamine and chondroitin. Instead of gluten-rich fillers, this dog food uses brown rice and ground rice. The brown rice is chock-full of Vitamin B and fiber. To improve digestibility even further, beet pulp is included. It provides natural prebiotics to keep your dog's digestive system healthy and functional. This hypoallergenic dog food from Royal Canin is designed and approved by veterinarians. It's formulated to provide a balanced diet to dogs with allergies. It's even capable of helping dogs with severe hypersensitivity issues. The limited ingredients are simple and easy to digest. The only source of protein is duck meat. This is complemented by a single source of carbohydrates, potatoes. Various vitamins and minerals are also included to ensure that your pup can stay healthy throughout their life. Salmon oil is another beneficial ingredient that can soothe the skin, keep it supple, and relieve itchy spots. 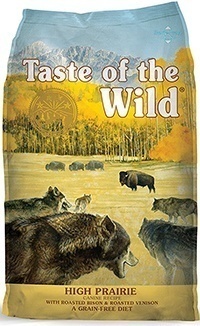 Taste of the Wild is known for its high-quality formula. This dog food is high in protein and utilizes unique meats that can prevent allergic reactions. Venison and bison are used instead of traditional options. These meats have a complex amino acid profile to help build strong muscles. The kibble is also grain-free. Sweet potatoes and peas are used as the primary carbohydrate source. There's also some fish meal and salmon oil included. The oil provides a healthy dose of omega fatty acids that can improve cardiovascular health and enhance the condition of your dog's skin. To help with digestion, probiotics are also thrown in. Dogs can suffer from food allergies for a number of reasons. Often times, newborn puppies inherent allergies from their parents and ancestors. If dogs in their bloodline developed allergies, there's a good chance that your pup may develop them as well. With that being said, genetics can be tricky. You should never assume that your canine companion is safe just because they're not genetically predisposed. Dogs can develop allergies over time. Furthermore, the irritant can cause reactions that get increasingly worse the more that your dog is exposed to it. Reactions occur because the immune system views a particular protein as dangerous. As the protein travels through the gastrointestinal tract, your dog's body may not break it up into amino acids like it's supposed to. As a result, the immune system will attack the protein. It's the body's way of trying to provide protection from a foreign invader. The process will result in uncomfortable bodily effects. One of the most common responses is the release of histamines that cause noticeable itchiness. Proteins are found in just about everything your dog eats. It's not just in meat. It's also found in fruits, vegetables, and carbohydrates. It's important that you figure out what the particular irritant is so that you can eliminate it from your pup's diet. Continued exposure to the allergen will make the response worse. The immune system gets better and better at attacking the perceived foreign invaders. Ultimately, your dog may become hypersensitive to the problem and develop potentially life-threatening reactions. Dogs can be allergic to pretty much any type of food. However, there are a few common offenders that are known to affect canines regardless of their size or breed. These include beef, soy, corn, wheat, dairy, chicken, fish, and much more. 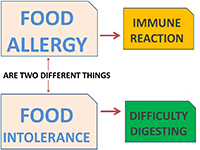 One important thing to remember is that there's a distinct difference between a food allergy and a food intolerance. It's not uncommon for owners to mistake the two. As mentioned earlier, allergies are a result of an immune system problem. Your dog's defense system is working unnecessarily hard to fight off proteins. On the other hand, intolerance is a digestive issue. It's when your dog's digestive tract can't process the food properly. Food allergies and food intolerance deal with completely different parts of your pup's body. Intolerance is fairly common and is usually no cause for concern. Most dogs will experience stomach issues at some point in their life. Food intolerance is often a result of eating something they're not used to eating, inferior ingredients, or too much fat. The easiest way to distinguish between allergies and intolerance is to look at the symptoms. Food intolerances lead to familiar issues like vomiting, gas, diarrhea, and other related gastrointestinal upsets. The symptoms of an allergic reaction can affect your dog's entire body and are more focused on surface-level issues. Allergic reactions manifest themselves on a dog much like they would on a human. The release of histamines commands nerves to transmit information to the brain, resulting in an itchy sensation. You may notice your dog scratching their skin, licking their paws, and biting their fur. Hives and skin rashes can also occur. This happens when plasma leaks out of the blood vessels in the skin as a response to the histamines. Raised bumps and redness may cover your dog's entire body. In addition to those symptoms, you may notice changes in how your dog looks. The fur may appear dull and less nourished because of the rashes underneath. If they continue to eat something they're allergic to, they could start to lose patches of fur as well. Hypoallergenic dog food works to keep your dog comfortable and healthy by eliminating the irritant. 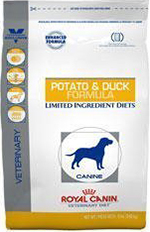 The formulas are designed to provide a balanced diet like a standard kibble would but are generally limited in their ingredients. With fewer ingredients, the chances of your dog suffering from an allergic reaction decrease. You'll be able to read the ingredients list and know exactly what your dog is consuming. To make things easier for dog owners, manufacturers formulate the food without any of the common allergens. They're often free of grain, wheat, soy, and other unnecessary fillers. A high-quality option will also be free of any meat byproducts and have a wholesome meat source as the first ingredient. One unique feature of hypoallergenic foods is that they typically utilize obscure ingredients that aren't found in standard foods. This is to accommodate the needs of dogs that are allergic to common protein sources like beef or chicken. Instead of those ingredients, you may find things like bison, pheasant, lamb, rice, and oatmeal. Some manufacturers take it a step further by using hydrolyzed proteins. The proteins are already broken up before they're added to the kibble. This effectively bypasses the break-down stage that often results in a reaction. Because the protein is already small and easy to absorb, the immune system won't attack it. Determining what your dog is allergic to is the first step in coming up with a solution. You should always consult with your vet prior to making any changes to your dog's diet. They'll be able to perform a thorough health checkup to make sure that there's not an underlying health issue that is causing the reactions. The simplest way to find the offending ingredient is to do a little bit of experimentation with the food. Take a look at the ingredients list of the kibble that caused a reaction. Keep an eye out for any potential allergens. If you find any common allergens that are known to affect dogs, switch to a different formula and see how your pup's body reacts. The most common are the protein meat sources and the carbohydrates. Try to switch to a food that has a significantly different formula. For example, if the protein source was chicken, find an option with lamb or bison. When you're switching foods, it's important that you keep them on the same formula for at least a month. This will give you ample time to record the results. Waiting a month to see the effects will also give you more accurate results. You should also avoid giving your dog any treats so that you can be sure that all reactions are directly caused by the food. You can continue trying out new foods and using the process of elimination to find the culprit. This method is quite easy and doesn't cause your dog too much stress. However, if you're still unsure about what your pup is allergic to, you can invest in a detailed allergy test. There are a number of options to get this done. Your vet may be able to perform a skin and blood allergy test to find the direct cause of an allergic reaction. There are even some simple at-home test kits that require the collection of saliva. Whichever option you choose, these tests can give you a clear picture of how your dog's immune system responds to certain foods. Allergies are never fun to deal with, even for a dog. You should take steps to provide your dog with relief as soon as you notice an allergic reaction. By making the switch to a high-quality hypoallergenic food, your dog can stay happy, healthy, and free of uncomfortable symptoms.